I’ve come to Thailand to get away from home. Away from work, away from politics, away from the usual and the comfortable. I’m in desperate need of a head-clearing adventure, away from my usual screens, routines, and pressures. Mostly, of course, I’ve come in search of noodles. On our first day in Bangkok, we leave our hotel and walk straight into a humid wall of hot air. We decide to start our quest exactly where we would look at home: close to the food, at the market. We hail a cab. 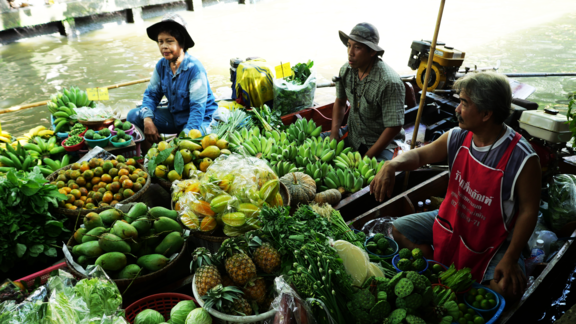 10 AM: The Khlong Lat Mayom Floating Market is just getting started. Vendors arrange mountains of tropical fruit and live seafood in large tubs, lining shallow plates topped with melting ice for their displays. I’m sweating through my shirt as we weave along the stalls. The market is mostly on dry land but lines the edges of the canals, where a series of long-tail boats float on the sides, ferrying fresh produce and a huge variety of noodles. Soon, I spot what I’m looking for: Pad Thai. 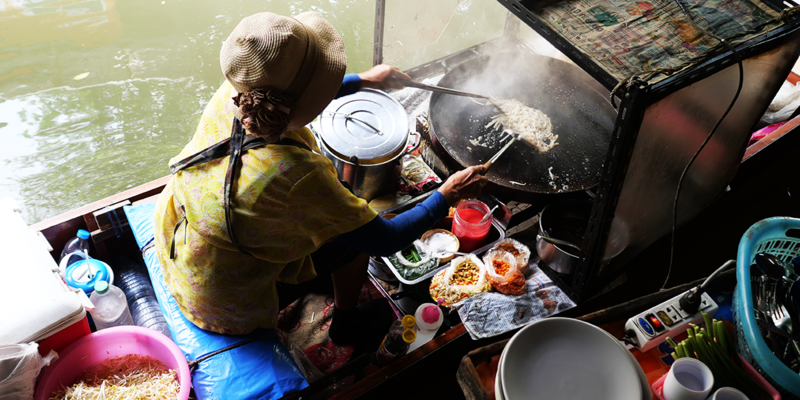 A woman presides over a large wok, powered by a propane burner encased in a small plastic box underneath. An electric fan mounted on top wicks away smoke and steam. It’s a pretty impressive set-up. This Pad Thai—buried almost entirely underneath a fried egg—has a pink hue from the tamarind juice she’s used to deglaze the noodles, adding a touch of sweet and sour. At home, Pad Thai can be a gummy, sweet, sticky, and starchy mess; this is fragrant with fresh lime and chunky bean sprouts. A small pile of peanuts on the side adds crunch. My wife opts for green curry noodles from the vendor next door: rice vermicelli noodles soaking in a curry sauce, electric green from Makrut lime leaves, with chicken and tiny green eggplants. It's giving off huge floral aromas balanced with the classic Thai notes of salty, sweet, sour and savory. Lemongrass, lime and chili interplay with careful balance. It’s the kind of dish that might transport you to a distinct place—except we’re already there. The eggplants barely hold their shape as they give over to the sauce. The cook directs us to the condiments table to season our plate: shredded cabbage for crunch, salt-fermented greens for funk, and optional raw sugar for sweetness. 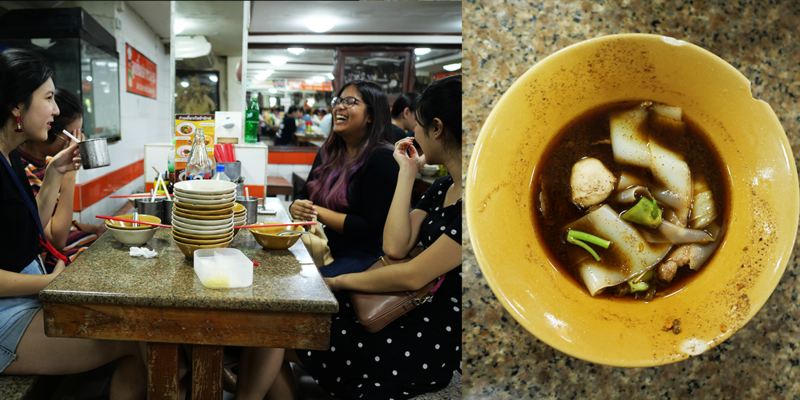 12 PM: Hidden behind a wall of tchotchke vendors at Victory Monument is The Best of Boat Noodle, a restaurant that makes, you guessed it: boat noodles, or guay diow rua, traditionally eaten by boatmen floating in the canals of Bangkok in partially filled tiny bowls so they wouldn't spill as they sloshed about on the river. The restaurant might be landlocked, but the serving tradition continues. Out front, the cook ladles a spoonful of raw pork blood into a bowl. A pasta basket filled with rice noodles gets a dunk in a cauldron of boiling broth before it's added to the bowls, instantly cooking the puddle of blood below. It's the blood that gives the broth its black, opaque sheen and deep beguiling flavor. We push inside and take a seat in the chaos. A waiter drops a small plastic sorting tray that could be used to sort fishing lures on our table and motions for us to pick from the array of sample noodles. I choose pork, with wide rice noodles; about an inch across, ghostly pale white, they fold back on themselves like layers of croissant dough. Thirty seconds later, the bowls arrive. Though we’re on the land, the tradition of the tiny spill-proof bowl continues: portions are served in chipped, palm-sized bowls holding a few slurps each. You finish in moments, and they just keep coming, one bowl after another. The noodles float in that inky black broth, topped with morning glory greens. A cloud redolent of cinnamon, pork, and Thai chili spice engulfs our table. Little broth-stained towers build up as a mark of accomplishment and pride between neighboring tables. We’ve begun to sweat in earnest now, our stomachs beginning to swell as the table next to us puts us to shame with another addition to their stack. We order another round. 2 PM: Everywhere we go, there are signs with rules: no smoking, no spitting, no vaping. Most common: no durian. I’ve heard about this funky fruit for years, but have never tried it. In my mind, it’s already the stuff of legends—a fruit so strong, it’s banned from buses, public spaces, and even in our rental. We meet Pim Techamuanvivit, the mastermind behind San Francisco’s Kin Khao, and her chef Meghan Clark at the Ortokor Market, a large indoor collection of food vendors adjacent to the famous Chatuchak Weekend Market. Kin Khao has made headlines for its distinctly West Coast take on Thai food, combining classic Thai flavors and recipes never seen in typical Thai take-out places with farmer’s market sourcing. We start in the blessedly air-conditioned organic section. Pim is searching for new ingredients for the kitchen at Bangkok’s renowned Nahm Restaurant, where she has been charged with updating their take on Thai fine dining. We taste various kinds of rice, a “fish” sauce made from krill shrimp (a truly funky drop of flavor that won’t wash out of my mouth for hours), tropical fruits and herbs. Meghan, however, is in pursuit of something special: perfectly ripe durian. 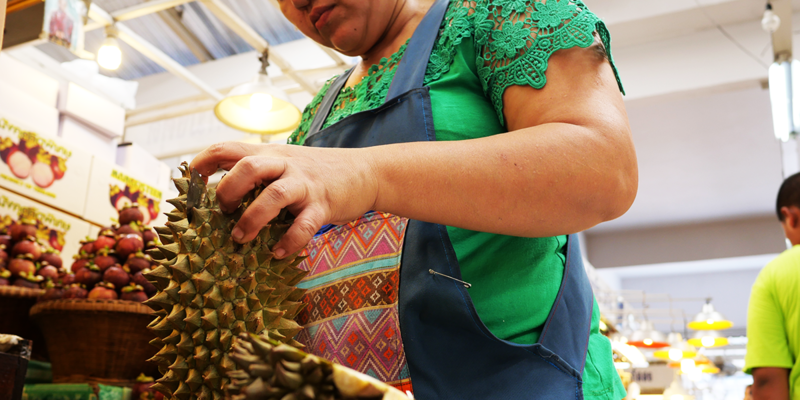 The edible part of the durian, the yellow flesh surrounding its large seeds, oxidizes almost immediately after being removed from its spiky green shell. The challenge lies in finding a vendor with the right touch; too early, and the fruit is flavorless. Too ripe, and the fruit turns to a soupy, stringy mess. Pim negotiates with a vendor in Thai. Our first choice hacks through a thick shell with a machete, but the prize is unripe: chalky, barely sweet, not much to go on. We give it back to the crestfallen vendor. The next offers me a too-ripe piece, and true to the legend, it’s goopy and sweet, almost putrid. Finally, we come to a vendor with fruit Pim approves of. This durian is golden yellow, with the softness and shape of an aquatic egg. The flesh inside is sweet, but tempered with a fermented flavor, something like a soft cheese. It’s… disappointingly delicious? After all the build-up, the prohibitive signs, the chatter, I was expecting something challenging. This—soft, custard-like and rich, with the texture of ripe avocado—is easy to love. We lick the leftover juice off our fingers as we wander the rest of the market. 4 PM: Malls are popular in Bangkok. Giant, multi-storied buildings crisscross with escalators, air-conditioned to the point of raising goosebumps. They’re a refuge from the oppressive heat outside, a crisp sanctuary of cold air even if the price is to be surrounded by loud, crass capitalism. It goes against my nature to even step foot inside a mall, but this is a local tip we have to explore. On the recommendation of a friend, we explore Terminal 21, an airport-themed mall where each floor is named for a destination. On the 5th floor, we arrive in… San Francisco. A giant red model of the Golden Gate Bridge (displaying uncharacteristically light traffic, I'd note) leads the way into a food hall. Inside, some thirty-plus vendors hawk all manner of Thai and Chinese specialties. We load up a token card with 200 Baht (about $5.50) and head into the fray. 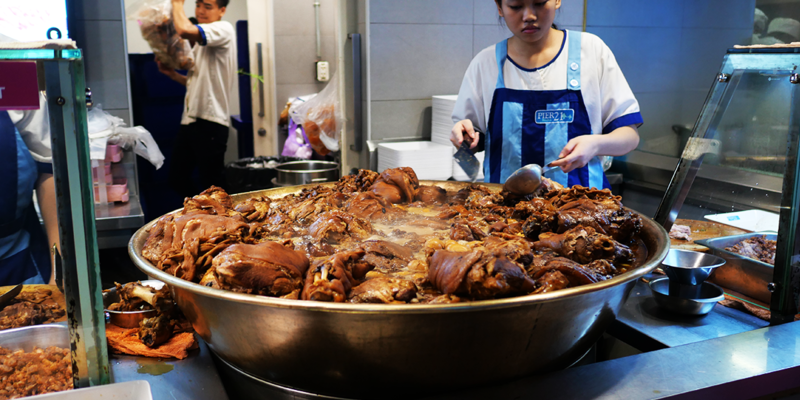 It doesn’t take us long to find our favorite stall: stewed pork leg, pulled from a bubbling cauldron of broth, lined with braised ham, the skin and fat pulling away from well-cooked bones with small pockets of hard-boiled eggs. The vendor pulls chunks of stewed meat with large tongs from the nearest leg, tearing chunks of flesh from the bone, dips them in the sauce pooling in the center of the bowl, and piles them on a plate of rice. A halved egg is placed to the side, and the whole arrangement is drowned in a fragrant brown gravy. We pile fermented greens on top for acid to cut the fat. He swipes my card; it’s about $1 for the plate. It’s a rich, rustic dish at odds with our mall surroundings. The dinging arcade and hum of the crowd are drowned out by its depth; by the time I resurface, my plate is gone, the last bits of sauce still greasing my lips. Fat and happy, we head back into the Bangkok’s wall of heat and noise. Gridlocked traffic isn’t moving anywhere and horns blare as anxious taxi drivers jockey for position. I’m too euphoric on pork fat to notice any of it, and we waddle down the street in search of our next order. An empty-city guide to the food and drinks you won't have to wait in line for.